Not to be confused with Warren, New York or Warren (hamlet), New York. Warren County is a county in the U.S. state of New York. As of the 2010 census, the population was 65,707. The county seat is Queensbury. 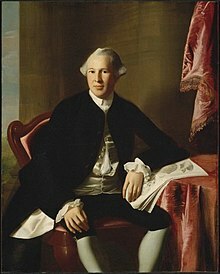 The county is named in honor of General Joseph Warren, an American Revolutionary War hero of the Battle of Bunker Hill. 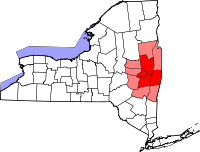 Warren County is part of the Glens Falls, NY Metropolitan Statistical Area, which is also included in the Albany-Schenectady, NY Combined Statistical Area. When counties were established in the Province of New York in 1683, the present Warren County was part of Albany County. The county was enormous, covering the northern part of New York State, all of the present State of Vermont, and, in theory, extended westward to the Pacific Ocean. It was reduced in size on July 3, 1766 by the creation of Cumberland County, and further on March 16, 1770 by the creation of Gloucester County, both containing territory now in Vermont. On March 12, 1772, what was left of Albany County was split into three parts, one remaining under the name Albany County. One of the other pieces, Charlotte County (named for Charlotte of Mecklenburg-Strelitz, queen-consort of King George the Third of England), contained the eastern portion. In 1778, the name Charlotte County was changed to Washington County to honor George Washington, the American Revolutionary War general and later President of the United States of America. In 1788, Washington County was reduced in size by the splitting-off of Clinton County. This was a much larger area than the present Clinton County, including several other counties or county parts of the present New York State. Washington County was slightly enlarged by the transfer of the Town of Cambridge from Albany County to Washington County in 1791. In 1813, Warren County was split off from Washington County, receiving its name in honor of General Joseph Warren. County officials first met in the Lake George Coffee House in the hamlet of Caldwell (known today as Lake George Village). James Caldwell, a patenee of the Town of Caldwell, donated land within the hamlet to serve as the county seat beginning in 1819. Halsey R. Wing became the first judge of Warren County in 1845. Lake George is the site of a YMCA conference center, the Silver Bay YMCA, founded in 1900 and one of only a few of its type in the United States . The Silver Bay Inn was built in 1904 and is on the National Register of Historic Places. In 1963, the courthouse in Lake George village was closed and operations moved several miles south to its present-day location at the Warren County Municipal Center main campus in Queensbury. According to the U.S. Census Bureau, the county has a total area of 932 square miles (2,410 km2), of which 867 square miles (2,250 km2) is land and 65 square miles (170 km2) (6.9%) is water. Warren County is situated in the eastern portion of New York state; the eastern border is Washington County. Being located in the Adirondack Mountains, it is not uncommon for mountain peaks to surpass 2,000 feet (610 m). The highest peak in the county is Gore Mountain at an elevation of 3,198 feet (975 m). The climate of Warren County is humid continental, as is most of New York State. In the winter, bouts of cold, dry air arrive from Canada, and interior sections of North America. In the summer, the Gulf Stream can bring days of hot, moist, humid air to the county. Extratropical storms often affect the county; in the winter, Nor'easters bring heavy snow and rain, and sometimes high wind. Fall and spring are generally relatively mild and pleasant, with fall foliage regarded as some of the most stunning in the country. In the summer and fall, back door cold fronts move in from the north and bring thunderstorms, sometimes severe. Monthly Normal High and Low Temperatures For Lake George, New York on the top and average monthly precipitation in inches on the lower section. As of the census of 2000, there were 63,303 people, 25,726 households, and 17,056 families residing in the county. The population density was 73 people per square mile (28/km²). There were 34,852 housing units at an average density of 40 per square mile (15/km²). The racial makeup of the county was 97.48% White, 0.62% Black or African American, 0.21% Native American, 0.55% Asian, 0.01% Pacific Islander, 0.23% from other races, and 0.91% from two or more races. Hispanic or Latino of any race were 1.05% of the population. 17.9% were of Irish, 12.7% English, 11.4% Italian, 11.1% French, 10.6% German and 9.0% American ancestry according to Census 2000. 96.3% spoke English, 1.4% Spanish and 1.0% French as their first language. There were 25,726 households, out of which 30.70% had children under the age of 18 living with them, 51.90% were married couples living together, 10.40% had a female householder with no husband present, and 33.70% were non-families. 27.30% of all households were made up of individuals and 11.30% had someone living alone who was 65 years of age or older. The average household size was 2.41 and the average family size was 2.93. In the county, the population was spread out with 24.00% under the age of 18, 7.50% from 18 to 24, 28.20% from 25 to 44, 25.10% from 45 to 64, and 15.20% who were 65 years of age or older. The median age was 39 years. For every 100 females there were 94.20 males. For every 100 females age 18 and over, there were 91.00 males. The median income for a household in the county was $39,198, and the median income for a family was $46,793. Males had a median income of $32,922 versus $22,279 for females. The per capita income for the county was $20,727. About 7.20% of families and 9.70% of the population were below the poverty line, including 14.10% of those under age 18 and 5.90% of those age 65 or over. The board of supervisors control weighted votes for county matters, based on the population of the towns they represent, with the Queensbury Town Supervisor and county supervisors having the largest number of votes on the board. The current Warren County sheriff is Nathan H. York. The sheriff's office is structured around three divisions; Administrative Services, Law Enforcement and Correction. The Law Enforcement Division includes both Investigative Services, Patrol Services and the Communications Center. Patrol Services have specialized units that operate under the control of the Division Commander. The sheriff's office provides boat patrols on Lake George and Schroon Lake. Warren County has been heavily supportive of Republican candidates since the Civil War. The Republicans currently hold 16 of 20 seats on the county legislature, and George W. Bush won the county with 55% of the vote in 2004. Both of Warren County's representatives in the state legislature, Elizabeth O'C. Little in the Senate and Teresa Sayward in the Assembly are Republicans. Currently Republicans constitute 51% of registered voters in Warren County, while Democrats account for 23%. Democrats have been steadily making inroads in recent years; Senator Charles Schumer won the county by 56% in his re-election bid in 2004, and the Democrats recently gained a majority on the Glens Falls City Council. John Hall, a Democrat, picked up the county judgeship position in 2003. In 2006 Republican John E. Sweeney was unseated in the district by Kirsten Gillibrand as Member of Congress. In 2009 Congresswoman Kirsten Gillibrand was selected by Governor David Paterson to replace Hillary Clinton as New York's junior Senator. Democrat Scott Murphy was elected to replace Gillibrand in a special election for the NY 20th congressional district. In the 2008 presidential election, Barack Obama narrowly carried Warren County over John McCain, with Obama receiving 16,281 votes countywide to McCain's total of 15,424 votes. Throughout the county, annual retail sales totals up to $1,010,937,000. General merchandise sales is $101,762,000. Apparel store's annual sales are $98,221,000 while annual food sales is $162,890,000. Health and drug store sales total up to $44,841,000. The county contains the highest concentrated area of medical manufacturers in New York state, with many medical inventions originating in the county. Norman Jekyll and David Sheridan introduced the medical device industry to the Glens Falls area. In the 1940s, they produced products that were from materials supplied by war-torn Europe. One of the primary manufacturers is AngioDynamics Inc., which is located in Queensbury, and is a producer of medical devices used in minimally invasive, image-guided procedures to treat peripheral vascular disease. Another major manufacturer of medical devices is Boston Scientific Corp., which is located in Glens Falls. In Warren County, there are 16 public elementary schools, with the largest being the Queensbury Elementary School, serving 1,150 students and the smallest being the Abraham Wing School, serving 146 students. There are nine middle schools, with the largest being Queensbury Middle School, serving 945 students and the smallest being the Bolton Central School, serving 285 students. There are also 11 high schools, with the largest being the Queensbury Senior High School, serving 1,301 students, and the smallest being the Bolton Central School, serving 285 students. In addition, there is one major private secondary school: the St. Mary's - St. Alphonsus Regional Catholic School, which is located in Glens Falls. SUNY Adirondack is the site of post-secondary education in Warren County. Located in Queensbury, the college provides an extensive program of degrees and certificate programs. SUNY Plattsburgh, based in Clinton County, offers bachelor and master-degree programs at the SUNY Adirondack campus. The primary healthcare center in Warren County is the Glens Falls Hospital, which is located in Glens Falls. Providing 410 beds, its most common procedure is miscellaneous diagnostic and therapeutic procedures. Regular bus service from Queensbury to Glens Falls is provided by the Greater Glens Falls Transit System. These also include trolleys that run on the road. The trolleys go from Bolton Landing (four times a day) and usually turn around just north of Hearthstone Point Campground on Route 9N. There are several state and county maintained roads in Warren County, making up a total of 464.7 miles (747.9 km) of roadway. The only U.S. Route is U.S. Route 9, which traverses the eastern portion of the county. The only interstate is Interstate 87, also known as the Adirondack Northway. Only New York State Route 9N traverses the Lake Luzerne region of Warren County. There are 2 state-maintained routes in Glens Falls, Route 9L, which terminates in the city. The second is New York State Route 32, which leaves Warren for Washington County, where it terminates at New York State Route 196. Also, on the east side of the city, there is County Route 79 (Boulevard), a former alignment of NY 32. There is New York State Route 149, a 32 miles (51 km) long road that traverses Warren and nearby Washington Counties. There is also New York State Route 254, a 6 miles (9.7 km) road in southern part of the town and enters Washington County as well. The third and final state maintained route is New York State Route 9L, which traverses down the central portion of the town. Several county routes traverse through Stony Creek. These include County Route 3, County Route 12, County Route 22, and County Route 76. There are several major routes in the town and village of Lake George. There is New York State Route 9N, which traverses north to south through the county. There is also County Routes 6 (Fort George Boulevard) and 59 (Bloody Pond Road). The latter is a continuation of New York State Route 9L and heads to terminate in Queensbury. In this town includes New York State Route 912Q, which is the Exit 22 connector/park & ride on the Northway. Although the region for Bolton and Bolton Landing is large, there is only one state-maintained route, Route 9N, and there is County Route 11 (Bolton-Riverbank Road), which is a connector to Exit 24 on the Northway. Only 2 county or higher maintained roads traverse the hamlet of Diamond Point, Route 9N and County Route 35 (Diamond Point Road), which connects 9N to the Northway (Exit 23) and U.S. Route 9 in Warrensburg. New York State Route 8 enters the county at Johnsburg, entering into the Town of Chester, where it merges with U.S. Route 9 for almost 4 miles, splitting off at the Landon Hill/Route 8/Route 9 intersection. New York State Route 8 terminates at an intersection with New York State Route 9N in the center of Hague. There are several state-maintained and county-maintained roads in the Warrensburg area. These include the termini of both New York State Route 28 and New York State Route 418 at US 9. There are also a few county routes including County Route 4 in Athol and County Route 10 (Horicon Road) in Warrensburg. Route 10 continues eastward, terminating in Bolton Landing. Amtrak serves Glens Falls on its Adirondack and Ethan Allen Express daily routes, which allow easy access to Montréal, Albany, New York City, and Rutland, Vermont, among many other towns and cities. Floyd Bennett Memorial Airport (FAA: GFL) is a county-owned, public-use airport located 3 nautical miles (6 km) northeast of Glens Falls, in the Town of Queensbury. Warren County is home to several music centers, including the Luzerne Music Center, which is a summer camp focused on teaching music, in the foothills of the Adirondacks. In July, it holds an annual Chamber Music Festival which is open for public viewing. The Upper Hudson Musical Arts is also a popular attraction, bringing concerts by professional chamber music ensembles and soloists to the Adirondacks throughout the year. Concerts are held at the Tannery Pond Community Center in North Creek. In addition, the Charles R. Wood Theater home to Adirondack Theatre Festival is a year-round professional theater in Glens Falls. In Warren County, New York on Lake George at Bolton Landing, Golden Heart Farm art colony the summer residence of Thomas and Wilhelmina Weber Furlong of the Art Students League of New York opened in the summer of 1921. The historically important art colony and artists in residence program were at the center of the American modernist movement as important artists like David Smith, John Graham, and Dorothy Dehner from Manhattan traveled to Warren County to escape the city and study with the couple. A New York State historic marker was placed for the Warren County Bicentennial honoring Weber Furlong On July 23, 2013 at City Hall in Glens Falls. Warren County is the primary area of tourism related to Lake George. Lake George is a 28,160-acre (114.0 km2) lake located in the Adirondack Mountains. Popular activities on the lake include river tubing, swimming, kayaking and boating. There are several large points of interest in the Lake George region. These include Prospect Mountain just outside town, Steel Pier along Beach Road which serves several tour boats. The village is a popular tourist spot and is home to many stores and novelty shops. There is the Lake George Battleground on the edge of the village along County Route 6. To the north, there are several hotels and motels to serve tourists visiting the lake. There are several campgrounds around the region including Hearthstone Point on Route 9N and Lake George Battleground south of the village. There are also several campgrounds on islands on the lake. These include Long Island, which serves 88 campsites. All island campgrounds and land-locked grounds are maintained by the New York Department of Environmental Conservation. Hamlet of Chestertown in Chester, typical for the area. ^ a b "The History of Warren County". Warren County Historical Society. Retrieved August 9, 2010. ^ "Silver Bay YMCA - Conference & Family Retreat Center". Silver Bay YMCA. Retrieved 1 April 2018. ^ "Old Warren County Courthouse, Lake George Village, Warren County, Lake George NY 12845". The Gombach Group. Retrieved August 9, 2010. ^ Parrott, Alex (June 13, 2005). "Lake George charm resides in its old buildings". The Post Star. Retrieved August 9, 2010. ^ USGS. "Gore Mountain topography map". Retrieved 2008-03-08. ^ a b c d Cornell Cooperative Extension (2007). "Climate of New York". Cornell Cooperative Extension. Retrieved 2008-01-30. ^ Weather Channel (2008). "Warren County Averages". Retrieved 2008-03-08. ^ a b U.S. Census Bureau (2000). "Warren County Census". Retrieved 2008-03-07. ^ Leip, David. "Dave Leip's Atlas of U.S. Presidential Elections". uselectionatlas.org. Retrieved 1 April 2018. ^ "Warren Count Board of Supervisors". Warren County Website. 2012. Retrieved 2012-04-05. ^ a b c EDC. "Government of Warren County". Archived from the original on 2008-03-19. Retrieved 2008-03-07. ^ a b Warren County Sheriff's Office (2006). "Warren County Sheriff". Archived from the original on 2008-03-21. Retrieved 2008-03-07. ^ Lehman, Don (March 28, 2011). "State budget decision may save Warren County Sheriff's Office boat patrols on Lake George". The Post Star. Retrieved March 30, 2011. ^ "Official Results General Election 11/04/2008". Warren County Board of Elections. 2008. Archived from the original on April 15, 2012. Retrieved April 5, 2012. ^ 2005 Rand McNally Commercial Atlas & Marketing Guide (2003). "Warren County, New York". Retrieved 2008-04-16. ^ a b c HRFM Law (2008). "Recent patents reflect vibrant medical-device activity in Tech Valley" (PDF). Archived from the original (PDF) on 2006-10-31. Retrieved 2008-03-07. ^ a b c Public School Review. "Elementary schools in Warren County, New york". Retrieved 2008-03-07. ^ Public School Review. "Queensbury Elementary School". Retrieved 2008-02-07. ^ Public School Review. "Abraham Wing School". Retrieved 2008-02-07. ^ Public School Review. "Queensbury Middle School". Retrieved 2008-02-07. ^ a b Public School Review. "Bolton Central School". Retrieved 2008-02-07. ^ Public School Review. "Queensbury Senior High School". Retrieved 2008-02-07. ^ Great Schools. "St. Mary's - St. Alphonsus Regional Catholic School". Retrieved 2008-02-07. ^ SUNY Plattsburgh. "Learn about SUNY Plattsburgh". Retrieved 2008-02-07. ^ New York State Department of Health. "Glens Falls Hospital". Archived from the original on 2007-04-14. Retrieved 2008-03-07. ^ a b PublicTransportation.org. "Transit systems in New York". Archived from the original on 2007-10-13. Retrieved 2008-04-02. ^ "Statewide Highway Mileage Summary" (PDF). New York State Department of Transportation. 2010. Retrieved January 12, 2012. ^ a b c d e f g NYSDOT (2006). "2006 Traffic report data" (PDF). New York State Department of Transportation. Retrieved 2008-03-07. ^ a b c d e N. W. Perry. "Warren County Routes". Empire State Routes. Retrieved 2008-03-07. ^ FAA Airport Master Record for GFL (Form 5010 PDF). Federal Aviation Administration. Effective May 30, 2013. ^ "Welcome to the Floyd Bennett Memorial Airport". Warren County Department of Public Works. Retrieved July 14, 2013. ^ a b New York State Arts. "Warren County Arts". Archived from the original on 2007-12-03. Retrieved 2008-03-07. ^ Visit Lake George. "City of Glens Fall". Archived from the original on 2008-04-20. Retrieved 2008-03-07. ^ Visit Lake George. "Warren County". Archived from the original on 2008-03-08. Retrieved 2008-03-07. ^ Trip advisor. "Prospect Mountain". Retrieved 2008-02-07. ^ a b Google Maps (2008). "Overview of Warren County Route 6". [Map]. Retrieved 2008-03-07. ^ a b Lake George Vacations. "Lake George Camping". Retrieved 2008-03-07. ^ a b NRHP. "Historic sites in Warren County". Retrieved 2008-03-07. This page was last edited on 29 March 2019, at 15:02 (UTC).